Skupaj s skupinama No force can in Invert. bomo 15.12.2018 "susali" na odru Dvorane Pekarna Gustaf. 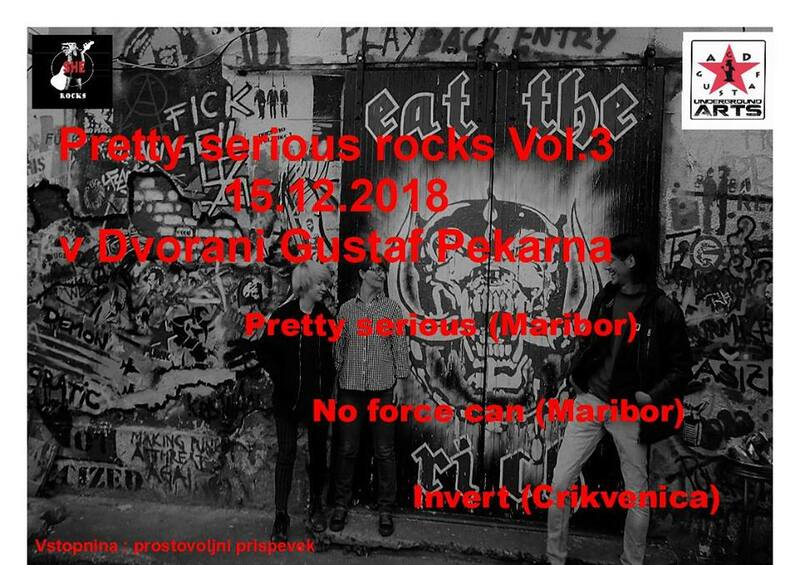 Invert is a four piece punk-rock band formed in Crikvenica, CRO in 2002. Members are: Vegi (bass, vocal), Igor (guitar, vocal), Bojan (guitar) and Leo (drums). They all shared the same interest in music, and started playing punk-rock covers. After a lot of hard work they entered the studio for the first time and the results were songs "In summer" and "One day". In December 2005. they entered the studio to record their first EP simply called "Invert". After wining a local band competition they were noticed by the record label "Ciklama Records" which is a sister label of "Dallas Records". In the summer of 2006, two of their new songs ("Nothing to lose" and "Something"s wrong") ended up on "Strasni Rijecani" compilation (Ciklama/Dallas Records). In 2011 they have released their first LP „What's the problem?“, but soon by the summer of 2012 they stopped playing and went on hiatus.